Princess Eliza is a bit of a whizz, she creates wonderful inventions which her parents think are great, but the King and Queen are also concerned that she is too busy inventing things to make any friends. Of course it doesn't help that she lives in a castle in the middle of snowy nowhere without any visitors ever. On seeing smoke across the forest one day, Princess Eliza decides to find out where the smoke is coming from and ask whoever is there for advice on how to make friends. To her surprise, she finds a cottage of over worked and over stressed little elves. With their Master feeling unwell, they can't see how they can possibly have everything ready in time - they have letters to read, toys to sort and gifts to wrap - and they just don't have time to help Eliza with her problem. So Eliza sets about inventing some new machines to help the elves and in the process unintentionally makes some wonderful new friends. The illustrations in this series of books are delightfully whimsical, with a great sense of fun, colour and humour. I particularly enjoyed the cheekiness in many of the characters expressions (those bears on the first page!!) and the detail in each illustration gives you more to discover in each revisit - and you will want to revisit! 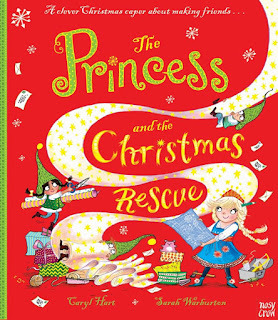 In a similar vein to The Worst Princess by Anna Kemp, The Princess and the Christmas Rescue is a wonderfully enlightened story that subtly urges readers to reconsider common gender stereotypes. Princess Eliza's parents don't demean her building and inventing interests, but express parental concern that Eliza also needs to have time for friends, and it is her particular skill set and passion for inventing that eventually leads her to making those needed friends. I found these elements of the story quite empowering. The Princess and the Christmas Rescue is the fourth in the Princess series, by author and illustrator team Caryl Hart and Sarah Warburton, all of which feature a different princess character. See here for KBR reviews of The Princess and the Peas and The Princess and the Presents.